Kicking tires may have worked for shoppers in the past, but not in today’s skid steer tire market. SSL tires are liable to kick back. They are compound-tough, engineered to either float or bite and as apt to be solid as air-filled. More to the point, anyone shopping for a skid steer tire should kick themselves if he or she doesn’t know exactly how to outfit their loader with tires. The other basic shopping consideration is price, which can range from $60 per skid steer tire to more than $600. “There are guys who have farms and get on a skid steer once every couple of weeks,” Sloan says. “Then there are the guys who use it every day. Two different markets. 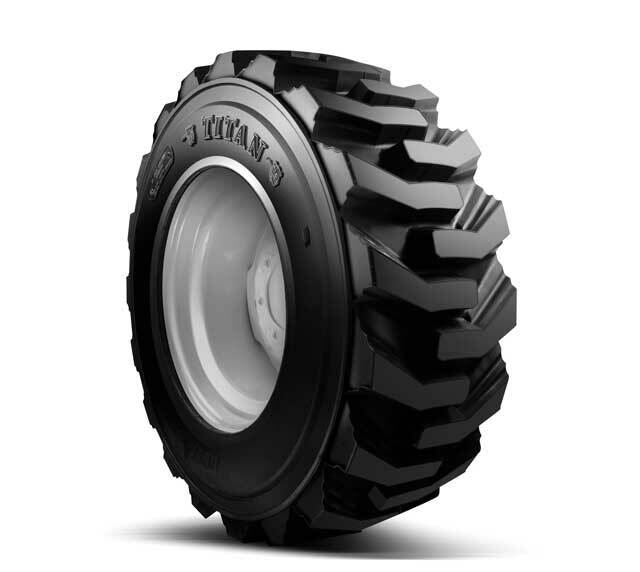 We’re in the higher end with premium skid steer tires offering performance and durability. There are a lot of skid steer tires that look very similar, but when it comes down to wear, they don’t meet the standard we have.” An example of the durable Titan line is the Ultimate, a mid-range priced pneumatic tire you can see to the right with unusually deep treads and sturdy sidewalls. Most tires for skid steer loaders are pneumatic, and Sloan says 98 percent of them are sizes 10-16.5 and 12-16.5. A third popular size is 14-17.5. 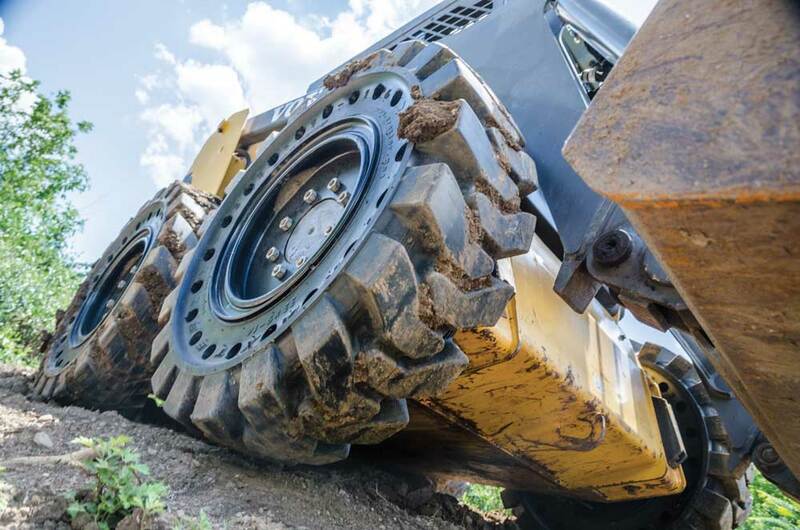 Though radials are the preferred choice on larger pieces of construction equipment, skid steer loaders mostly roll on bias tires. “We only have one radial tire in the skid steer line,” says Eric Hartzler, wholesale manager for Midwest Equipment (MWE). “The issue being that radials on skid steers are harder to repair. Radials are more expensive. You begin to approach what you will pay for solid tires.” A best-selling bias product at Midwest Equipment is the Lifemaster, a versatile, air-filled tire with bidirectional tread that loves snow. Flotation tires may be losing market share. Hartzler, for example, doesn’t “stock a lot of flotation at Midwest Equipment. That sort of changed with the introduction of tracks on compact equipment. Going to tracks is a much better option than flotation tires.” Tire dealers and manufacturer reps can remember when inventory for compact loaders was 80 percent tires. Now it’s closer to 70 percent tracks. 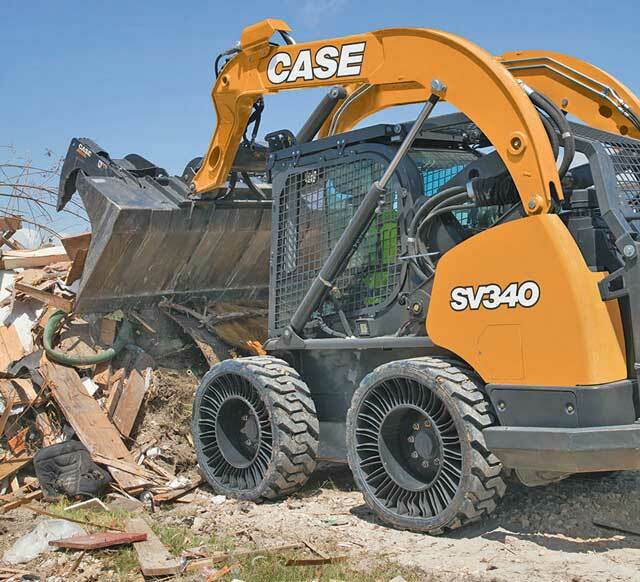 While the continuing evolution of tires in the skid steer market makes choosing the best tire more difficult, it also gives buyers more precise solutions. Lopes considers that a welcome trade-off. Whatever the choice of tire, it will wear out eventually. To monitor wear, tire industry experts advise operators to check their tires at the start of each day, looking for gouges or cuts. Uneven wear on the tires — the front tires usually go first — warrants tire rotation. And they advise buyers to know if a certain tire has wear indicators built in. If it does, they say, keep an eye on it. Michelin’s Tweel SSL is a hybrid that doesn’t fit neatly into any category but rides smoothly across all of them. It is an “airless radial tire.” More precisely, it is neither a tire nor a wheel, but a combination of both with a rigid steel center that bolts to a hub and is connected to the ground-bearing tire surface by “flexible, deformable, high-strength poly resin spokes.” It was developed at a South Carolina Michelin facility and is manufactured there. Patented in 2003, it entered the skid steer market in 2012. Michelin engineers say the spokes flex and transfer energy like an air-filled tire but, unlike a pneumatic tire, the Tweel doesn’t deflate. In sum, the Tweel is radial for strength, solid for severe applications and durably buoyant. 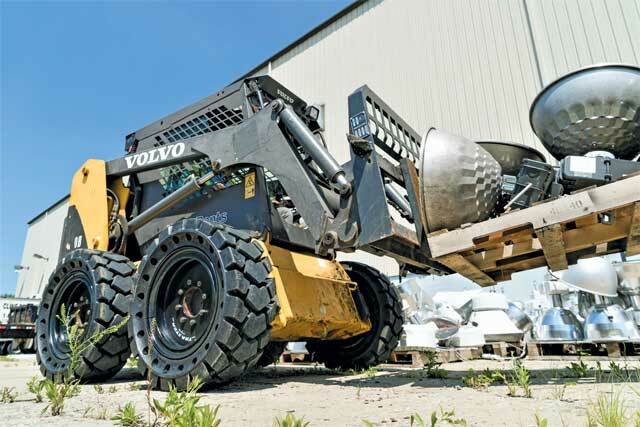 The company claims better fuel economy for skid steers that roll on Tweels, more uniform ground pressure, greater tolerance for turf and an overall gentler ride for operators. All of this innovation comes at a price, of course. A Tweel smooth, hard-surface skid model is around $700, while a hard-surface traction model or an all-terrain model can cost north of $1,000. The upfront cost looks better in context: If the functional life of a Tweel significantly exceeds that of traditional skid steer tires, spreading the extra cost across the additional work hours can produce comparable true value. Though skid steer owners in North America have had the Tweel option for several years, it wasn’t offered in the United Kingdom till last year. That expansion of its market suggests the Tweel’s influence in the skid steer tire industry is growing. Click here for more info on tires.